If you were one of the 32,000 households that lost power this past February, you know the home-camping experience can grow old quickly. For some, the outages were catastrophic, for others an inconvenience. And the difference in those experiences can be attributed to something as simple as which fuel provider you have contracted to service your home. 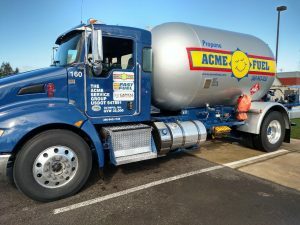 The folks at Acme Fuel pride themselves on the customer service they provide. But this past snowstorm was truly a test of their reserves. A nasty strain of influenza had already taken out a few of their office staff. Then the snowstorm hit. Those new customers were earned from other fuel companies that were not able to make it out. Mike was on call the first night of the snowstorm. “We are a small, tight-niche company,” he says, “and we know that if we all pull together we can get it done.” That first night, Mike had customers out of fuel in Rochester and Rainier to deliver to and the Evergreen State College called and had 14 generators running that needed diesel fuel. “Lonny instantly stepped up and volunteered,” says Mike of co-worker, Lonny Kirschbaum. Mike tried delivering fuel to one customer but couldn’t get through the driveway – the snow-loaded tree branches were so low they were blocking the driveway. “I called the customer and asked if they had a saw,” recalls Mike, “they walked one out to me and I was able to cut through to get in.” Afterward, the customer told Mike to hang on to the saw until after the storm was over, figuring Mike needed it more than he did. 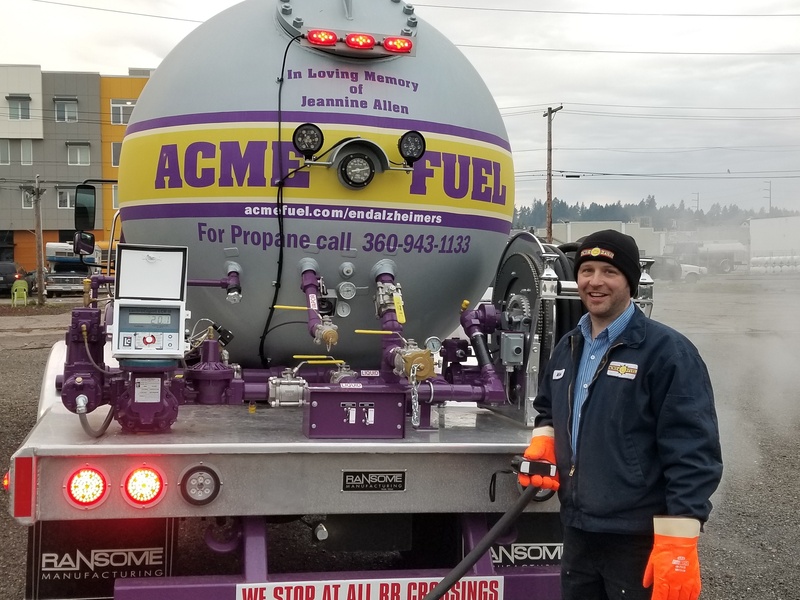 Whether it is St. Peter’s Hospital, Evergreen State College, any of the restaurants, greenhouses and businesses that Acme services, or making first tracks down a family’s rural driveway, Acme works hard to keep those generators, furnaces, cooktops and water heaters running. And the trust and relationships they have built along the way just keep growing. Customer service extends to commercial jobsites that need their road equipment topped off too. Acme Fuel can take care of any size operation. Acme will deliver to your jobsite and fill your off-road equipment. You can contact Acme’s Commercial Fuel webpage or call their office for more details on this. During the storm, Acme’s Fast Fuel pumps were open for business with both ethanol free gas and diesel. Not everyone knows that the Fast Fuel stations are available to everyone. “Yes,” says Allison Dumas, Acme’s fleet card program manager, “anyone can use the Fast Fuel Pumps. They are open to the public 24/7 and there are no monthly minimums.” There are other benefits to being part of their Fast Fuel program too. Customers can save up to 15 cents per gallon off the credit card price and get detailed statement reports and flexible usage controls. The two Fast Fuel locations in Olympia are at 303 Thurston Avenue NE and 501 Lilly Road SE. To put Acme’s history of customer service to work for you, just drop by their office or visit the Acme Fuel website.